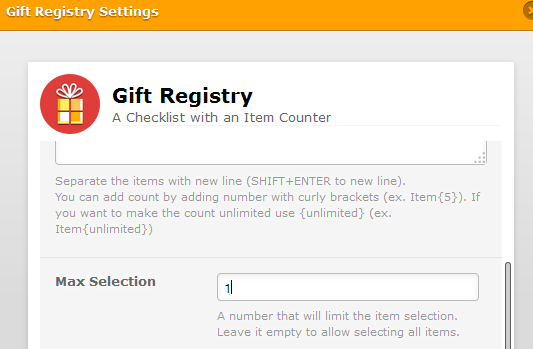 How to set up Quantity Gift Registry widget to allow only one selection? We are using this widget to have people sign up for workshops, which have limits on how many people can attend. We do not want it to be possible, however, for a person to sign up for more than one workshop. Is there something we can do to prevent someone from doing so? You could use instead the Gift Registry widget. It has the option to allow only specific number of selections.